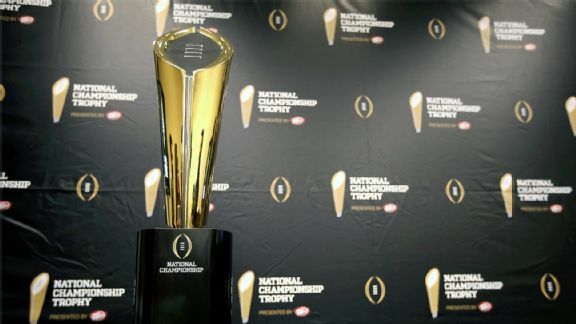 SEC teams went 8-1 in Week 1 as the race for the national championship trophy began.A quick refresher: Last week, ESPN Stats & Information released its preseason conference power rankings, a formula that equally weighs the rankings from the AP Poll and ESPN’s Football Power Index (FPI) in order to determine the best and worst conferences in the country. For more information on the rankings and FPI, click here and here. After an exciting slate of non-conference games in Week 1, the SEC proved why it was considered the top conference in the nation entering the season. The SEC went 8-1 in non-conference games, the best winning percentage of any FBS conference. Ole Miss, Georgia and LSU all beat opponents ranked in the top 50 in the preseason Football Power Index, while Tennessee and Alabama took care of business against improved FBS teams. What may be surprising is the way that some of these SEC teams won the games, though. The SEC was not nearly as dominant in its wins as some may have expected. LSU had the lowest average in-game win probability (34%) of any team that won this weekend, and Alabama, Ole Miss and Georgia were all in one-score games in the second half. Nonetheless, the SEC pulled out these wins and jumped 1.4 points in the conference power rankings. The strength of the top of the conference (six teams in top 15 of the AP Poll) is unmatched by any other conference. The Big Ten had the second-best winning percentage in non-conference games of any of FBS conference. Notable wins include: Rutgers beating Washington State in Seattle, Penn State defeating UCF in Ireland, and Ohio State outlasting Navy in Baltimore. However, the other nine wins for the Big Ten were against six FCS teams and three lower-tier FBS opponents. The main reason that the Big Ten fell in the ratings, however, is that last week’s numbers were based off of the preseason AP Poll that did not account for Braxton Miller’s injury. Ohio State struggled in the first half against Navy without Miller, and as a result, the AP voters dropped the Buckeyes from fifth to eighth despite a win. That was the second largest drop in AP ranking for a team that won last weekend (UCLA went from 7 to 11). The ACC dropped five more points in the conference power rankings after Wake Forest lost to Louisiana-Monroe, Syracuse almost lost to Villanova, North Carolina struggled against Liberty and Florida State played a closer-than-expected game against Oklahoma State. Clemson's loss to Georgia also significantly affected the ACC in the ratings because the top of the ACC is considered even weaker than when it began the season. Florida State is the only team from the ACC ranked in the top 20 of the AP Poll; every other Power Five conference has at least three top-20 teams. In terms of the bottom of the ACC, Syracuse, Boston College, North Carolina State and Wake Forest all have an FPI below zero (zero is considered an average FBS team by FPI). No other Power Five conference has more than two such teams. Week 2 is a big week to prove conference superiority. Highlighted by Michigan State traveling to Oregon, the Big Ten is a part of three marquee games next weekend. Michigan will look to build upon a strong Week 1 at Notre Dame and Ohio State will look to prove it can be successful without Braxton Miller as it hosts Virginia Tech. In the Pac-12, Oregon likely needs to win at home against Michigan State in order for it to stay alive in the playoff. Also out west, USC and Stanford will meet in one of the top Pac-12 games of the season.